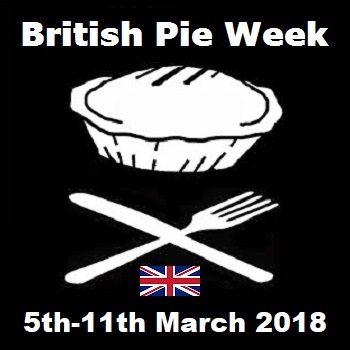 Pierate - Pie Reviews: Pieday Friday - 2nd March 2018 - All things British Pie Week! Pieday Friday - 2nd March 2018 - All things British Pie Week! This year Pierateer Rob has organised another Birmingham Pie Night (see below for more details) and is taking Wednesday off work in order to be a media reporter at the 10th annual British Pie Awards! 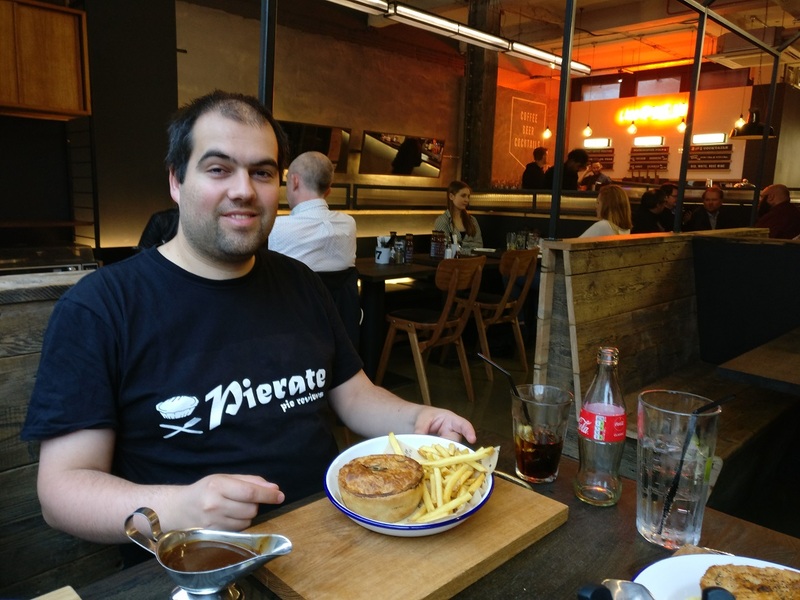 He'll be joined at the British Pie Awards by Pierateer Sam, who has also taken the day off to be a Pie Awards judge! 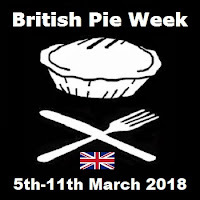 On top of that the Pierateers will be eating a pie (minimum) every day of pie week, doing a daily blog post of the things we and the nation are getting up to in British Pie Week and generally promoting the biggest week in pie!! It'll be on Tuesday 6th March from 5:30-7:30pm. And the good news is there is still time to join us! While the full details are in our Birmingham Pie Night post, all you need to do is phone the store and reserve a table from 5:30-7:30pm, which is when me and a group of friends will be there! If you do come along, I'll be wearing the Pierate t-shirt you can see below, so do pop over and say hi!!! 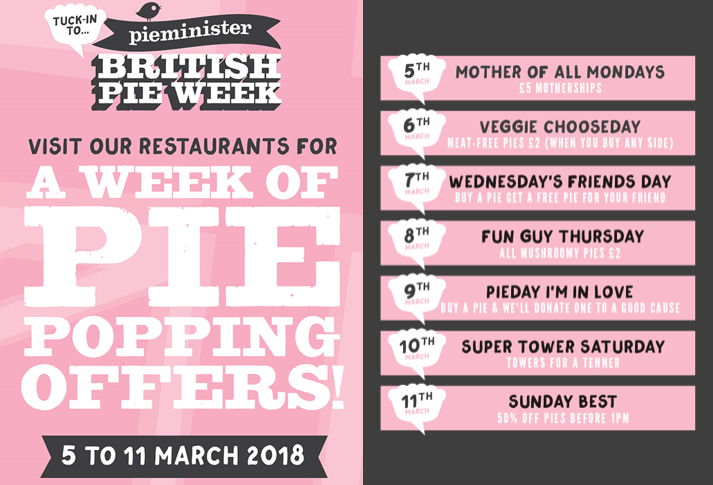 British Pie Week 2018 is 5th to 11th March! Everything there is to know about British Pie Week - including pie-motions! It turns out loads of people want to know all there is to know about British Pie Week! With well over 1,000 views of our "British Pie Week - Everything you should know" article already, and thousands more looking at our Countdown to British Pie Week and British Pie Week Logo Launch articles, this has proved to be our busiest pre-Pie Week period to date! MyPie Pie Truck (London) - Our number 1 pie seller MyPie London have shared on twitter that they're doing their legendary "Pie meal for a fiver" promotion during British Pie Week! Check out the MyPie website for where Chris and the gang will be this week! Pubs serving MyPie (London) - If standing outside waiting for a pie from a pie truck doesn't sound your thing, the great news is that throughout British Pie Week much-loved Clapham Common craft beer pub The King & Co and newly refurbished sibling freehouse the Elm Park Tavern in Brixton Hill will be serving up the Pierate Highly Recommended MyPie in their pubs! Visitors to the two popular independent South London boozers will be able to take their pick from the latest selection of proper pies by the cult favourite British Pie Awards winner, such as chipotle pork shoulder with black beans, or mushroom, spinach and truffle, all accompanied by homemade mash, greens and gravy (£10.50). More info on the Pieminister website and to get you in the mood, why not check out all 19 of our Pieminister pie reviews so far? 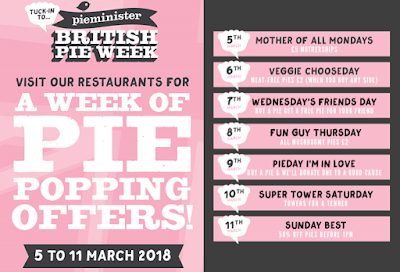 Bowen Pies (Chorley and nationwide delivery) - We're delighted to hear that Pierate Highly Recommended pie maker Bowen Pies - who we rated while visiting Wigan a few years ago - have just launched a pie delivery service just before the start of British Pie Week. Great timing guys! 🐷 New OINK BOX 🐷.. Who Loves A Good Pork Pie?! Joanna’s (London) - This is somewhere we are yet to rate but comes highly recommended by a friend of the blog! Critically-acclaimed Crystal Palace institution Joanna's (who will be celebrating their 40th anniversary next month!) will be offering an exclusive dish on their daily a la carte menu for British Pie Week, showcasing the very best of the new Spring produce. Guests at the beloved neighbourhood restaurant can tuck into the comforting seasonal special of slow-cooked lamb, rosemary and pea pie with wild garlic mash, ideal paired with a fine French wine by local wine merchant Les Vins de Sylvain and followed by one of their irresistible new desserts like cinnamon doughnuts with hot chocolate sauce. The Redhouse (Newcastle) - Another place on our Pierate to-do list when we finally sail the Pierate Ship up to the North East, this popular pie shop in Newcastle is releasing a special guest pie for British Pie Week - and it sounds fab!! Almost time for the 10th annual British Pie Awards! 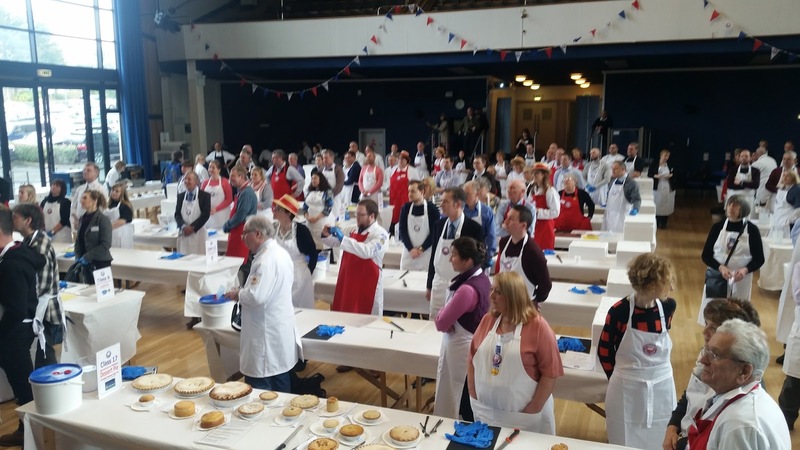 It's become a pie institution just fractionally older than Pierate Pie Reviews itself, as the British Pie Awards in Melton Mowbray celebrate this year their 10th annual awards event! Read our Countdown to the British Pie Awards article for more info! 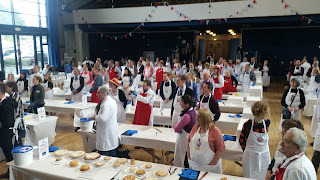 With this year over 900 pies from a record breaking number of entrants, we can't wait to judge (Pierateer Sam) and provide media coverage (Pierateer Rob) from the greatest show in pies!! We were glad to see last year that the British Pie Awards 2017 champion was in fact a pie, after the controversy of the winner of the British Pie Awards 2016 not being a pie at all - but a pasty!!! We wait and see what sur-pie-ses they have in store to mark this special 10th anniversary year!